Coastal cliffs on the north coast of Highas Cay. The barrier reef and breaking waves. 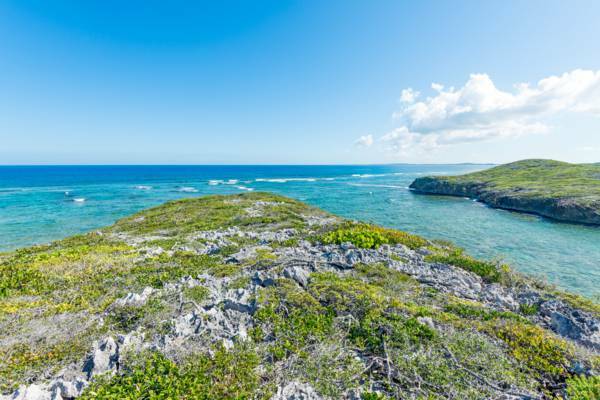 Found between the northwest extremity of Middle Caicos ( Juniper Hole), Highas Cay is a uninhabited, scenic, and yet rarely visited 112 acre (45 ha) cay. The varied terrain of this island is quite beautiful. The north coast is quite similar to the rolling limestone bluffs and hills of the Crossing Place Trail, with the barrier reef and deep ocean water off the wall only a short distance off the coast. Several small beaches, surrounded by low cliffs, are found on this side of the island as well. The interior consists of the typical dry brushlands common to the Turks and Caicos and Bahamian islands. The south coast is edged by a unique and quite dense band of wetlands and mangrove swamp. The small and secluded beaches of Highas Cay. Although a tropical island nation, the Turks and Caicos is notorious in its lack of indigenous varieties of edible fruits and nuts. Due to Highas Cay’s location at the north end of Crossing Place Channel, the waterway that separates North Caicos from Middle Caicos, the southern swampy side of the island is a natural collection point for flotsam. Due to this reason, coconuts and other seeds have washed ashore. A small grove of naturally-established coconut palms are found here, and some noni trees (also known as cheese fruit) as well. 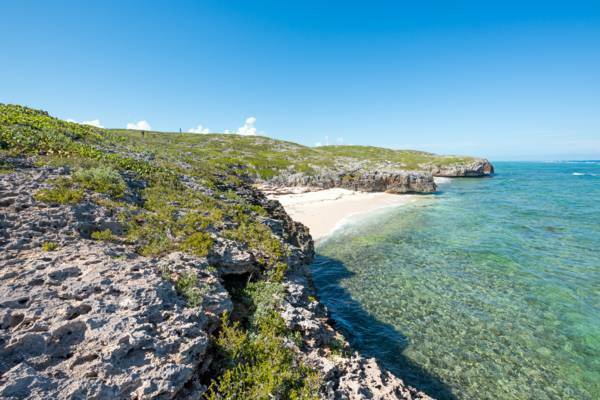 Although there is no evidence of ruins or settlement on Highas Cay, the island is infested with the invasive brown rat (common rat). It’s unknown how rats became introduced, possibly by a shipwreck or by swimming over from Middle Caicos, and this pest has changed the fauna of the island. Curly tail lizards and many types of birds have almost completely disappeared, and the Turks and Caicos Rock Iguana would very likely be established on the cay if not for their presence. Last reviewed by an editor on 23 October 2018.